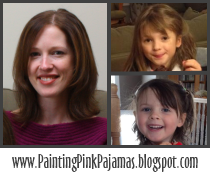 Painting Pink Pajamas: Birthday prep, and a few online freebies! My gal's 3rd birthday is coming up on Valentine's Day, so I have some party prep to do! Due to my Hubby's schedule that weekend, we may have to have an evening party, which throws a kink into the party planning, but I've been brainstorming ideas until we finalize the time and how many people will be available to come. She has already informed me that she wants a strawberry cake. Not the Strawberry Shortcake character, but a cake made with strawberries. The problem is, she doesn't eat strawberries. Unless they're in pie or a smoothie. If I try to give her a strawberry in its natural state, she won't eat it. So, I searched the Internet (what did I ever do without the Internet?! ), and found a recipe for cake made with strawberry puree which got fantastic reviews on allrecipes.com. Now I just need to decide what shape to make it in! Does anyone know of any good websites for cake decorating? I don't know how to use fondant icing (and I do't have time to learn), but I can hold my own with using different shaped icing tips (The picture is of last year's birthday cake). I plan on making some of these felt-covered barrettes for party favours (I've been meaning to make them for ages, using our many mis-matched barettes!). I may also try larger versions that are just a flower or a heart, instead of the almond-shape. I found heart cookie cutters at Michael's, and I'm going to try to make drawstring bags for loot bags. My other thought is to make homemade chocolate-on-a-stick. I'll let you know how the crafts go! While searching for decoration ideas, I found an amazing papercraft on Little Acorn - A squirrley valentine! (there is a second version as well) Mine will be going up on a window tomorrow! I may make a few more, but I pressed the exacto knife so hard while doing the cutting - d'oh! -that I have a bruise now, so I'll wait a few days. You can also find cute printable valentines on Inside a Black Apple and Arian Armstrong's blog. Arian also has a bunch of other great free downloads, including a weekly planner, Christmas tags, a children's reward chart and stationary. I love her art! That's about it for me! Until C's big day I'll be busy working, helping Hubby with a fundraiser for church, celebrating my own birthday (30! ), and going to Ottawa on a business trip. I'm looking forward to some down time in the spring with our new family of 4! Happy birthday to you and your little girl! What kid doesn't like strawberries??? I've never heard of such a thing! LOL I'm sure she will love the cake -- it sounds divine! I wish you a ton of success with the birthday cake and hope to see pictures. You rocked last year's cake. Wow, I am impressed. Wish I could give you advice on the cake but that's DEFINITELY not my area of expertise! :-) Best of luck with the party planning and Happy Birthday to both you and your daughter. Have a good weekend. Happy upcoming birthday to you! I can't wait to see what you come up with for your daughter's party. I love seeing the ideas that people create. My son's is in March and I'm not sure what I'm going to do yet.